Cheats for GTA 5 – GTA 5 Cheats is not an official Grand Theft Auto V fansite. It is the number one source for 100% working cheats, codes, hints, tips and glitches for GTA 5 (Grand Theft Auto). The site is in no way affiliated with Rockstar Games or Take-Two Interactive. ‘Grand Theft Auto’ and the ‘Grand Theft Auto’ logos are trademarks of Take-Two Interactive. Grand Theft Auto (also known as simply GTA) is one of the most popular and controversial video game series of all time. It is developed and publised by Rockstar Games. While the first GTA game debuted way back in 1997, it wasn’t until the release of Grand Theft Auto III, which brought the series into a 3D setting, that it really gained wide acclaim and attention. Grand Theft Auto IV was (prior to GTA V) the latest title to have been released in the series and hit store shelves in 2008 for the Playstation 3, Xbox 360 and PC. Two expansion packs for the game were subsequently developed, “The Lost and Damned” and “The Ballad of Gay Tony”. The next game in the series, Grand Theft Auto V was officially announced by Rockstar on 3 November 2011. Prior to this, on 25 October 2011, Rockstar changed the homepage of their website to display the logo for Grand Theft Auto V (as above). The “V” has since become famous for its stylization as a bank note. 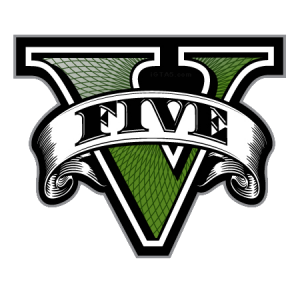 The new logo was accompanied by a statement that a trailer for GTA V would be released on 2 November 2011. The trailer, which can bee seen below, was indeed made public on 2 November and revealed that the game will take place in Los Santos. Los Santos is a fictional version of Los Angeles and various surroundings in California, including Hollywood (called “Vinewood” in the game”).